The teachers for whom I ever felt affection were few: Tich Morris (definitely), Spiv (improbably) and Tom Beastall. Tom had the advantage of not knowing me until the last couple of years of my school career. Perhaps he had no preconceptions of me to influence him. I think he started at the School in my O-level year 1957-1958. At least, he was my history teacher that year, and for the following lower-sixth year, at the end of which I left, never to see him again. My abiding memory of him is a nice man who, against my better judgement, encouraged a love of his subject in me. I think, but cannot be sure, that he was responsible for an enthusiasm for history that persists to this day, and which led me, eventually, to study it at tertiary and post-graduate level and to publish a number of articles and a book that still features, probably in a minor way, on student reading lists about nineteenth-century rural English history. So, who was this bloke who saved me from total academic perdition? What can be gleaned about him, almost 60 years on and from half a world away? 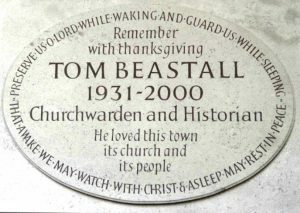 Tom (not Thomas) William Beastall was a Yorkshireman. Born in, or near, Doncaster on 3 September 1931, he lived close to his birthplace for most of his life. According to the 1911 census and 1939 ID card ‘census’, his father, also Tom, was a joiner. In a 1927 Kelly’s directory, Tom Senior was also listed, as a beer retailer. He had married Tom’s mother, Margaret, in 1926. Little else is known about our Tom during the early years. By 1939, if not earlier, the family was living in Stanley House, Wilsic Road, Tickhill, near Doncaster, a house which, when it was put on the market in late-1953, was described as being on an acre and a half of land, with four bedrooms and an orchard. It sounds like a comfortable middle-class home. Middle-class comfort was confirmed when Tom Senior died in 1977 leaving over £28,000. After the house was sold, the family moved to Sandal House, Dadesley Road, Tickhill, no later than 1955. Our Tom was still living in this house when he died on 12 January, 2000. Where Tom went to school and university is not known, but by 1956, he had been awarded a Master of Arts degree. 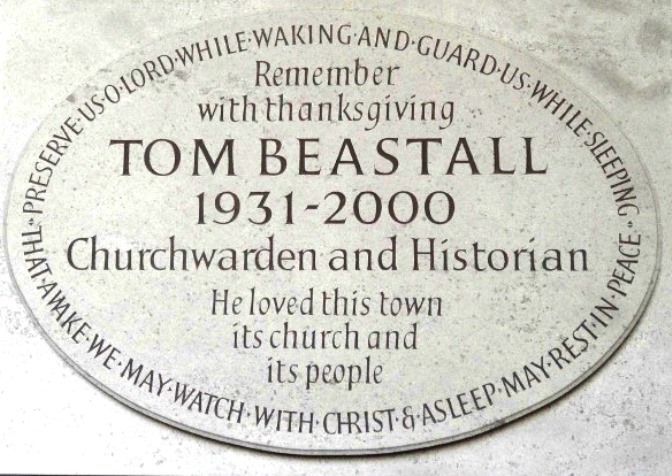 The Government Gazette of that year notes the promotion of Tom W. Beastall M.A. from Pilot Officer to Flying Officer in the Royal Air Force. 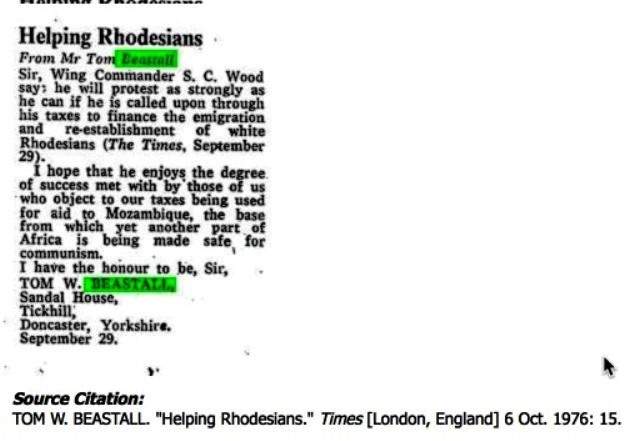 The following year’s Gazette has him in the Royal Airforce Volunteer Reserve (Education Branch). 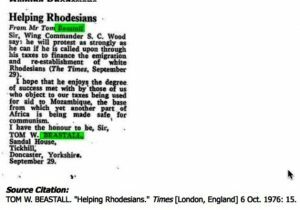 In 1962, the Gazette shows that he had resigned his commission in November 1961. This RAF background explains Raymond Carter’s recent recollection, on the Old Cicestrians’ Facebook page, of Tom’s rôle in the RAF section of the School Combined Cadet Force around 1960. By the 1970s, if not earlier, Tom was back in Yorkshire teaching at Maltby Comprehensive in Rotherham where he became Deputy Head. He also taught History in Workers Educational Association classes in and around Tickhill for many years where he inspired the formation of the Tickhill Historical Society. (http://www.tickhillhistorysociety.org.uk/index.asp). Whatever one’s views on Tom’s approach to politics and history, nothing can detract from his contribution as a teacher, an activist, and a researcher/writer in his chosen discipline. I, for one, am grateful to have known him. Others are as well, as a memorial plaque in Tickhill confirms. Paul Taylor I had Tom Beastall for General Studies in 6th year when we each had to research a topic and make a presentation. As I was developing an interest in betting and horse racing I did mine on the history of the Jockey Club. Tom Beastall, being a historian, was fascinated and quizzed me for what seemed like ages on Lord George Bentinck and other notable 18th-century horse racing aristocrats.